Categories: Toronto Condos | Tags: 10 Bellair, 10 bellair condo, 10 bellair street, high end condominiums for sale, luxury condo toronto for sale, toronto condos for sale, yorkville condominiums | Permalink. M5V Condominium is located in Toronto’s Entertainment District along historic King Street West just east of Spadina. M5V Condominiums is a modern and spectacular building with views of downtown Toronto and Lake Ontario. 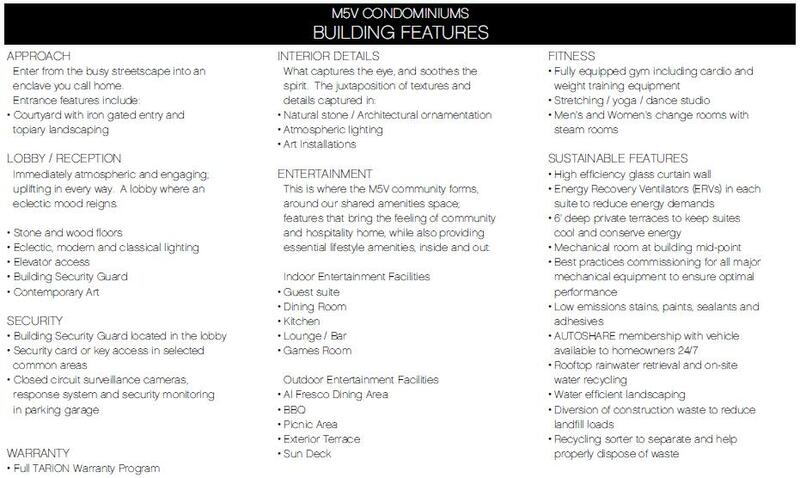 M5V was designed to be a model of sustainability in urban condo living and construction. It is the perfect mix of design and green philosophy with luxurious features. One interesting feature is the vibrant red box Mechanical Room at mid-tower. It is an innovative feature that maximizes efficiency, houses the building’s rainwater retrieval system, and enhances the building’s commitment to sustainable design and development. Spacious – six foot deep – balconies have been designed to shield the interior from direct sun in the summer. Construction of suites and common areas uses low-emission materials. Energy-efficient appliances and water conserving fixtures utilized. Compact floor plates allow for efficient circulation and ample natural light in each suite. Scavolini kitchens from Italy, direct fresh air via an in-suite Energy Recovery Ventilator (ERV), programmable thermostats, and stainless steel European appliances; including a 5 burner gas cook-top. M5V is the winner of the 2007 Greater Toronto Home Builders’ Association for Best Architectural Design, Best Community, Best Sales Office and Best Suite Design (over 1500sf). 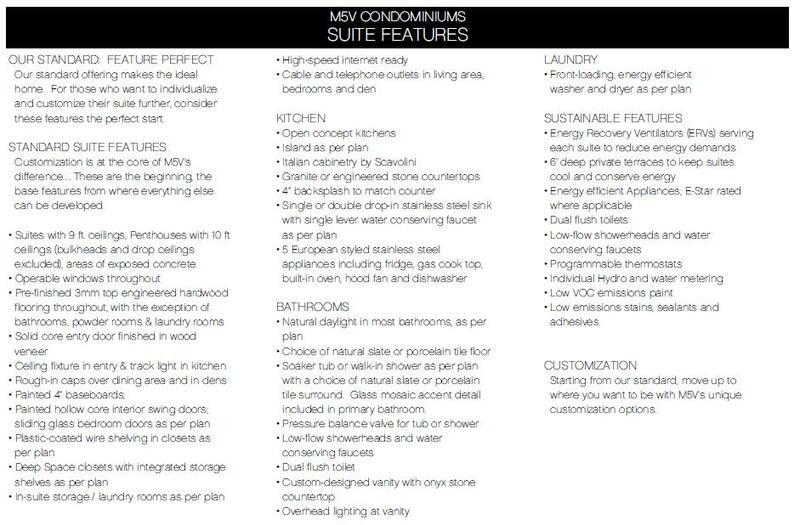 M5V has adopted LEED® for their guiding principles. This is the industry guide and recognized measure for the sustainability of a building in North America and around the world. M5V is among the first residential condominium buildings in Toronto who have registered for LEED® certification. Categories: Toronto Condos | Tags: affordable condominiums in toronto, M5V Condominiums, M5V Condos, toronto condominiums | Permalink. Waterview Condominiums consist of four condominiums in the Humber Bay Waterfront by Monarch. It is located near the intersection of Park Lawn and Lake Shore Boulevard. 2 Glass towers rise above a four-storey podium with 13,000 square foot of recreational amenities including an indoor swimming pool / whirlpool, change rooms and saunas. The Breeze Club will also feature a well-equipped fitness centre with an aerobics area. There is a theatre, billiards room, meeting room, party room, cyber lounge with computer stations and three furnished guest suites. Other features include a 24-hour concierge service, a landscaped terrace with barbecue facilities, visitors parking and an underground car wash bay. Premium south facing units have panoramic views of Lake Ontario. One Bedroom units start at $229,900 for sale and $1,350 for lease. One Bedroom + Den units start at $249,900 for sale and $1,550 for lease. Two Bedroom units start at $299,900 for sale and $1,700 for lease. Two Bedroom + Den units start at $479,000 for sale and $2,500 for lease. Please contact me to obtain the MLS listings or to view any of the units at Waterview Condos for sale or for lease. 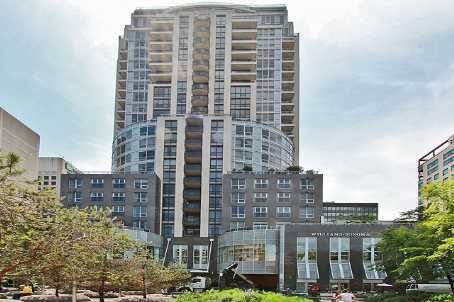 Categories: Toronto Condos | Tags: 2119 lake shore blvd, 2121 lakeshore blvd, condo prices and rents, condos for lease, condos for rent, etobicoke condos, humber bay, monarch, remax condos plus, Toronto Condos Downtown, toronto condos for sale, waterview condominiums, waterview condos | Permalink.